Bunga – Scientific name: Areca catechu L.
Betel, common name for a tropical vine (see Pepper), sometimes called betel pepper. In Asia and the East Indies the leaves of the plant, together with a little quicklime, are used to wrap the seed kernel (called betel nut or areca nut) of the betel palm. Chewing this preparation (also called betel) stains the saliva bright red and eventually darkens the teeth. An alkaloid in the nut acts as a stimulant and a tonic. Scientific classification: The betel belongs to the family Piperaceae. It is classified as Piper betle. 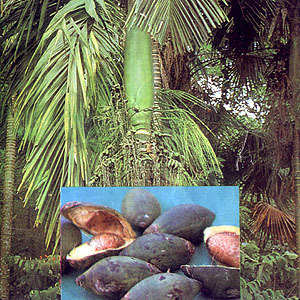 The betel nut palm belongs to the family Arecaceae (or Palmae) and is classified as Areca catechu. This entry was posted in List of Medicinal Plants in the Philippines and tagged Betel-nut Palm, bunga on March 9, 2009 by Pinoy Herbs.